Time to visit the Playground again with a snippets card and as usual there is a super prize on offer and in fact this time around it looks as if there could be a double win. I've used some large and small snippets for this card but apart from the card blank I've not cut into any new pieces. The background is from a Prima pad which I've had quite a long time and I always save the left over pieces at the back so that I can use them for another project. 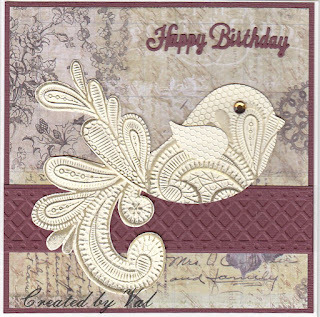 The bird was built up using some snippets of cream card using a bird die and a 3D embossing folder. I started with the bird and wing shapes which I then embossed; the next move was to emboss some more pieces of cream card so that I could fussy cut (with scissors) the flourish areas to form the elaborate tail feathers. Gold gilding wax was rubbed lightly over to bring out the detail before assembling the final bird and adding a gem for the eye. I found some snippets of brown card from which I cut and embossed a border strip and also the sentiment. Do take a look to see the clever card Di has made this time using a number stamp and some of own snippets - a great idea. WOW the bird looks simply fascinating with the texture !! what a stunning and striking snippets creation. I love that wonderful embossed bird it is so striking and luxurios looking almost like satin or silk. Wow, what a stunning card Val, I love the bird that you've created with the die and the embossing folder. Wow! This is absolutely stunning Val - LOVE the bird, so, so beautifully made. As Jenny L says, the bird looks as if it's made from satin. Oh my gosh I totally missed this one. I love, love the detailing on your bird. Fantastic result. Hugs Mrs A .